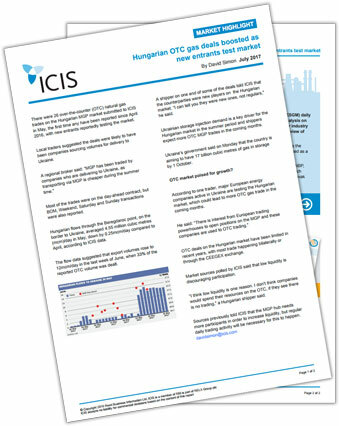 There were 26 over-the-counter (OTC) natural gas trades on the Hungarian MGP market submitted to ICIS in May, the first time any have been reported since April 2016, with new entrants reportedly testing the market. Most of the trades were on the day-ahead contract, but BOM, Weekend, Saturday and Sunday transactions were also reported. ICIS looks at the reasons behind this spike in trading activity and whether this will be a sign of things to come for the Hungarian gas market.